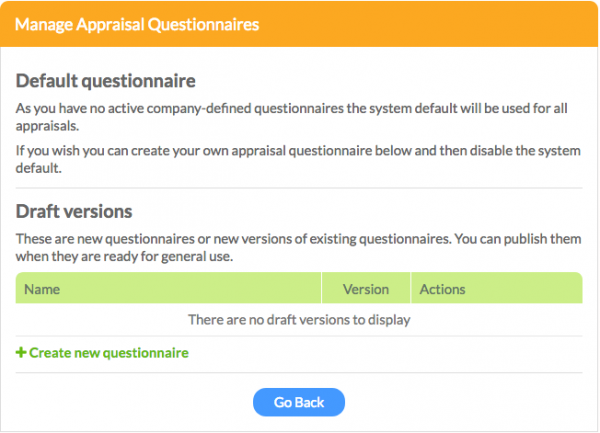 6 types of appraisal system – and which one is best for your business? The most common types of appraisal are: straight ranking, grading, management by objective, trait and behaviour-based appraisals and 360 reviews. The most appropriate method for your organisation will largely depend on the variety of different roles within your organisation, the time you have available to invest in the review process, and your objectives for carrying out the reviews. It’s also possible to incorporate elements of each methodology within your review meetings. Management by objective, for example, will help you measure progress towards tangible goals, like sales targets. Whereas trait or behaviour-based appraisal could be useful in identifying how roles could be adapted to enable employees to better play to their strengths, or where additional training might prove beneficial. The important thing to remember is that you review each employee via the same process so as not to discriminate. This compares all employees to each other, ranking them from best to worst. Whilst it may be easy to see who’s a high flier and who’s not making the cut, everyone in the middle will be harder to rank. This method falls short by overlooking strengths that may not be immediately obvious. For it to be reliable it must follow a systematic method of comparative evaluation or it runs the risk of being subjective and unfair. It also assumes that everyone is the same, and in reality a business needs a mix of different people and characters to succeed. This systematic method that allows a manager to quickly see an employee’s level for any given skill e.g. teamwork, communication, attention to detail etc. They could be scored A – F or 1 – 5 or even from unacceptable through to excellent. This method is also subjective and so could be seen as unreliable if used alone. The thinking behind this modern method is based around both employee and manager jointly setting goals to be achieved within a specific time period. It’s thought that when an employee is involved in the goal setting process it’s more likely they’ll achieve their goals. This form of appraisal is a process rather than a one-off evaluation and it’s all about planning and being proactive rather than reactive to events and circumstances. It’s considered a fair way to appraise because it avoids subjective bias, it’s not costly to do and it encourages self-awareness which should in turn improve an employee’s ability to contribute well to the team. Trait-based appraisals assess characteristics that contribute to an individual’s personality, such as creativity, extroversion and confidence. This might be how warmly a customer service advisor speaks to a customer, for example. The negatives to this type of appraisal is that it’s highly subjective and some character traits are more obvious than others, making it possible to overlook certain characteristics that are equally valuable. It’s also difficult to set measurable goals around developing character traits. Behaviour-based appraisals focus on the employee’s ability to carry out specific tasks, so they can be useful for assessing performance on quantitative tasks and for deciding on who to reward or promote based on their competence in these tasks. Provided the standards for appraisal are well thought out to begin with, behaviour-based appraisals tend to offer a relatively objective way of assessing performance. Half-way between behaviour and trait-based appraisals, the behaviourally anchored rating scale aims to combine and benefit from both. It’s particularly useful for employees who need to perform detailed tasks with accuracy but also need to possess certain traits such as empathy and caring. It places the behaviours an individual can display when performing a task against a scale, from outstanding to unsatisfactory. i.e. Completing a task accurately and in a timely fashion through to failing to complete the task. As this approach can be individualised to the different tasks required by each individual across the organisation, it is considered a fair and straightforward way to assess and quantify employee performance. It also means employees can clearly see the behaviours they would need to display to achieve higher ratings. Such personalisation of the scale to each different role, however, does make this method quite time intensive to set up and will need updating regularly as roles evolve. This method involves feedback from several people who have contact with each employee, keeping biases firmly at bay. This could be several other colleagues, clients, customers etc and even the employee themselves is required to offer their view of their role in the team. 360-degree appraisal is hailed as the best approach because it’s all-encompassing (the secret’s in the name!) and can give such a well-rounded view of an employee. Not only does it give a manager a precise understanding of an employee’s attitude and behaviour, but it can also benefit the individual by helping with self-improvement (in turn giving them confidence, which will help your business no end). More than 85% of all the Fortune 500 companies use the 360-degree feedback process as a central feature of their overall leadership development process. While you may not feel your business is at the stage of needing a “leadership development programme” as such, the ideas that underpin this type of appraisal offer benefits to a team of any size. Traditional annual appraisals can be a source of stress to employees if they feel that they will be criticised and their behaviour pulled apart, so it’s important to build a culture that makes regularly giving and receiving feedback a normal and familiar part of your company every day. Dropping a few thank-yous here and there will also go a long way towards alleviating any stress associated with formal appraisals, as your team will know that you see both sides of the coin, rather than being hell-bent on pinpointing the negatives. Our HR software allows you to manage appraisals by providing a form containing a series of default questions that can be filled in and submitted on the system. You can also customise the form to better suit your business’ needs. 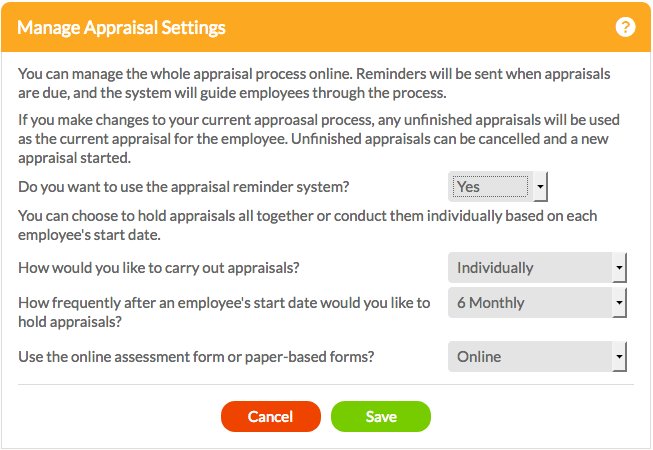 You can also use the software to send out reminders of upcoming appraisals, meaning you’ll never miss one and your staff can get prepared. If you’d like any guidance on running staff appraisals in your business, our consultants can help. Give us a call on 0333 444 0165 or email help@citrushr.com. What is a performance review or appraisal?